When you’re younger, opportunities to socialize are around you on a daily basis – from chatting with your co-workers, visiting with friends for happy hour or having the family over for a weekend birthday party. Suppose you’re a senior, retired from a lifelong career and spending time alone because the children have grown up and moved on, and friends no longer have time to visit – things could feel a bit lonely, right? Studies have shown that those who have close relationships and friendships tend to live longer – and feel more fulfilled – than those who don’t have an opportunity to engage socially throughout the day. Socializing is more than just sharing about the day’s activities with someone. In fact, socializing and maintaining relationships is crucial for boosting cognitive, physical and emotional health! How can socializing help with your loved ones physical and cognitive wellbeing? Social interaction has been known to reduce the risk of various cancers, as well as decrease the risk of developing rheumatoid arthritis or cardiovascular diseases. Additionally, maintaining an active social life helps reduce the risk of Alzheimer’s disease and effectively lowers blood pressure. In terms of socializing, many of the same feelings we have with a lack of friendships or interaction, such as loneliness or depression, can affect your loved one. Feelings of depression or loneliness can cause your family member to be less inclined to get outside to exercise, thus leading to higher blood pressure or putting your mom or grandfather at a higher risk of developing cognitive or physical diseases. There are numerous ways to help your loved one get the social interaction they need – and crave. 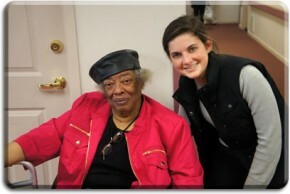 Senior living communities cater to the social life of its residents through social hours, events and daily activities. If your loved one is still living at home, hiring a professional home health care provider is an ideal option to spend a few hours a day or week offering companionship with your parent or grandparent. Home health care providers do much more than just assisting with bathing or preparing a meal – they become a friend and companion to your loved one and interact with them during activities they love most. Home health care providers can transport your parent to the local senior center for a day of socializing or can remain in the home engaging in daily hobbies and interests, such as watching movies, scrapbooking or playing board games.